3-Spoke Ultra light aluminum built hubs are machine-lathed so the outside rim is perfectly balanced and the bearing space is exactly parallel. EPIC hubs are bright-dip anodized to avoid scratching and keep it looking great for the life of the wheel. Epic hubs are made of 6061 T-6 aluminum and rated for up to 500 pounds. 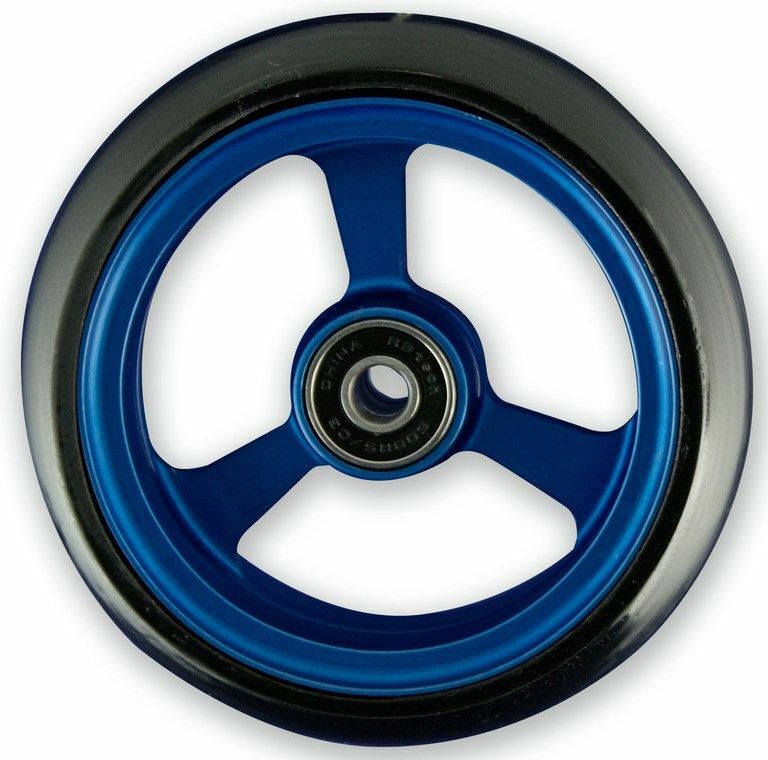 What makes Frog Legs EPIC Soft Roll wheels different? Wide Sloping Sidewall Tyre: Our arced tread design ensures the area contacting the ground is spheraical. A ball-shaped tyre will pivot and roll much easier than a straight edge that gets caught. The extra girth distributes the downward pressure so the wheel maintains higher floatation and does not sink into carpet and other surfaces. Custom High Resilient Urethane Tread: Other "polyurethane" treads contain recycled material or are infused with water creating a "foam". Frog Legs treads are spun-cast from virgin base chemicals. Use of recycled materials results in harder tread with minimal rebound. A foam contains microscopic air bubbles which absorb moisture. Moisture can increase weight up to 25% and reduce rolling efficiency significantly. Highly Resilient: Like a super ball our tread bounces back when compressed to minimize energy loss and absorb vibration. Clean, Quiet & Smooth: EPIC solid urethane will not absorb water so there is no dirty water tracked inside. The high-resilient material eliminates the "ticking" sound from tile.